← Heavy Duty Clamp On Over The Bucket Forks Are Built To Last! Handle Trash Efficiently and Easily With A Skid Steer Hopper Attachment. 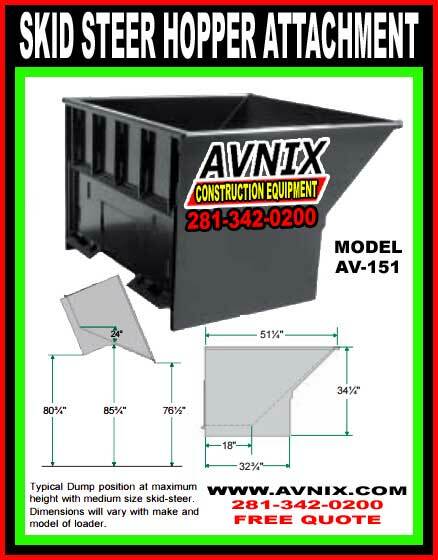 Avnix skid steer trash hoppers easily handle debris, landscaping mulch, loose sand, dirt and other loose material. Our Skid steer garbage hoppers attach directly to the skid-steer quick-tach mechanism making it simple to position empty hoppers wherever they are required. When hopper is full, the 24° skid-steer can rapidly carry the hoppers to the disposal spot and dump contents into larger crane trash skips or onto a trash heap. Our long lasting skid steer hoppers are ideal for concrete rubble, wallboard scraps, tear off, cement, drop from the masonry saw, and nearly all types of construction or plant refuse. Skid steer hoppers are also popular with landscapers because they can distribute & position landscaping materials like sand, rocks, gravel and other loose materials at a lower cost. At the material loading yard a skid-steer can quickly fill hoppers with landscape materials such as sand, dirt or mulch, and load them onto the a flat bed truck for delivery. At the job site a skid-steer lifts the full hopper off the truck and deposits the material right where it is needed. 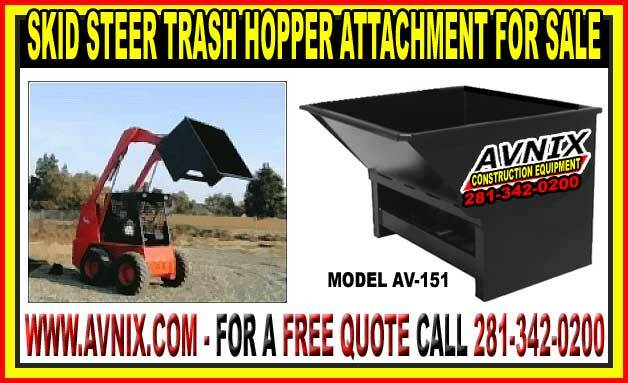 This offers a modernized professional system for getting material from the material yard to the job site placement area with minimal re-handling, less material loss, and more cost effective..
Our Heavy Duty Hoppers are designed and built for durability and long life. In fact, they will most likely outlive your skid-steer loader. Shell & sides are constructed of rugged 3/16″ steel plate. Reinforced Heavy Duty Universal Quick-Tach fits most skid-steer loaders. Forklift pick-up points are provided for moving hoppers around the material yard or loading onto trucks. Optional Casters – makes it easy for one man to push a hopper around inside or outside a building. AV-151 48″ 1.00 cuyd 558 lbs. AV-152 72″ 1.50 cuyd 740 lbs. AV-153 84″ 1.75 cuyd 775 lbs.